Paul Tesar was born and raised in Cleveland, Ohio and received his undergraduate degree in biology from Case Western Reserve University. His undergraduate thesis focused on mesenchymal stem cell biology in the laboratories of Dr. Stephen Haynesworth and Dr. Arnold Caplan. Paul went on to earn his DPhil (PhD) from the University of Oxford as a recipient of a prestigious scholarship from the National Institutes of Health. 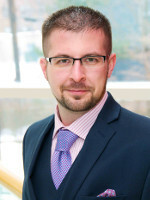 His graduate studies under the tutelage of Professor Sir Richard Gardner and Dr. Ron McKay provided a paradigm shift on how we understand and utilize stem cells for research and medicine and culminated in a landmark paper in Nature describing the discovery of a new type of pluripotent stem cell, epiblast stem cells. This work stands among the most recognized in all of stem cell biology and earned Paul some of the highest graduate student accolades including the Beddington Medal from the British Society for Developmental Biology and the Harold M. Weintraub Award from Fred Hutchinson Cancer Research Center. Paul returned home to join the CWRU School of Medicine faculty in 2010 as a Mt. Sinai Health Care Foundation Scholar and his laboratory has pioneered new regenerative approaches to treat nervous system disorders including multiple sclerosis, pediatric leukodystrophies, cerebral palsy, and brain cancer. Paul is currently an Associate Professor and the Dr. Donald and Ruth Weber Goodman Professor of Innovative Therapeutics at CWRU School of Medicine in the Department of Genetics and Genome Sciences. Paul's scientific achievements continue to be recognized with a number of prestigious awards including being named a Robertson Investigator of the New York Stem Cell Foundation in 2011. One of only four international awardees, the honor recognizes and supports scientists leading their generation in stem cell research. Additionally, Paul received the International Society for Stem Cell Research Outstanding Young Investigator Award in 2015, the New York Stem Foundation - Robertson Stem Cell Prize in 2017, and the Diekhoff Award for Graduate Student Mentoring in 2018. Paul has also co-founded a Cleveland-based biotechnology company to advance new therapies from the laboratory into clinical testing to better the lives of patients and their families. Our laboratory sits at the interface between stem cell biology and developmental neuroscience. We use pluripotent stem cells to model neurological development and disease with a specific focus on glial cells in the central nervous system - oligodendrocytes and astrocytes. We are interested in the molecular mechanisms by which cells acquire glial fate and function during development and maintain their functionality throughout life. We leverage this knowledge to define the cellular and molecular dysfunction that underlies certain neurological diseases and strive to develop meaningful therapeutic interventions using high throughput chemical screening and other approaches. Drug screening for human genetic diseases using iPSC models. Clemastine fumarate for promotion of optic nerve remyelination. Modeling the Mutational and Phenotypic Landscapes of Pelizaeus-Merzbacher Disease with Human iPSC-Derived Oligodendrocytes. Transcription elongation factors represent in vivo cancer dependencies in glioblastoma. Drug-based modulation of endogenous stem cells promotes functional remyelination in vivo. Isolation of epiblast stem cells from preimplantation mouse embryos. New cell lines from mouse epiblast share defining features with human embryonic stem cells. Derivation of germ-line-competent embryonic stem cell lines from preblastocyst mouse embryos.